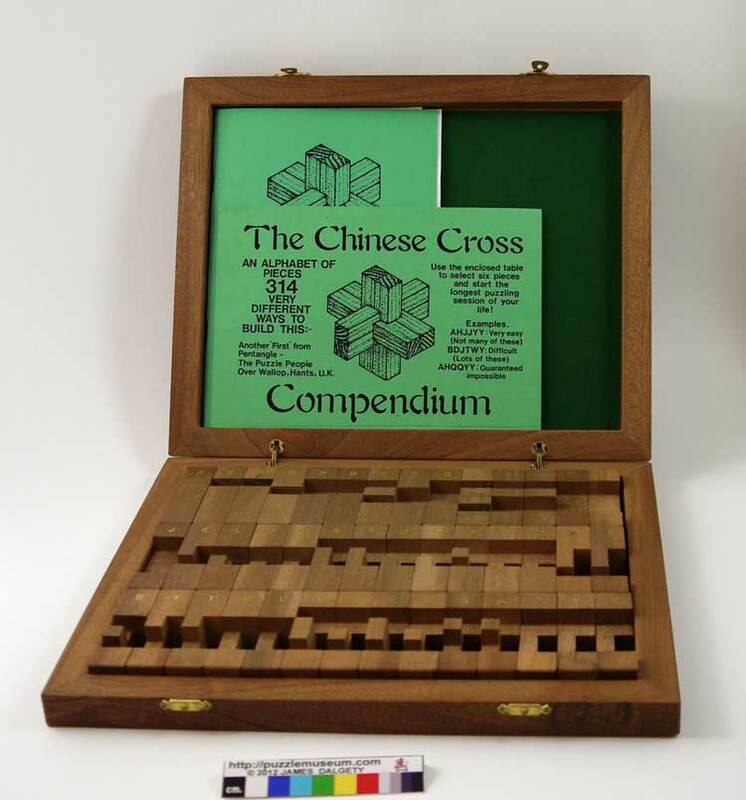 THE CHINESE CROSS, THE MALTESE CROSS and THE JACK PUZZLE. Early examples are known from the late 18th century. Versions in ivory have been imported to Europe from China since the early 1800s. Most of the early versions were based on the same design. The standard rule is that there are only 6 pieces and that grooves in the pieces are always cut half way into the piece. 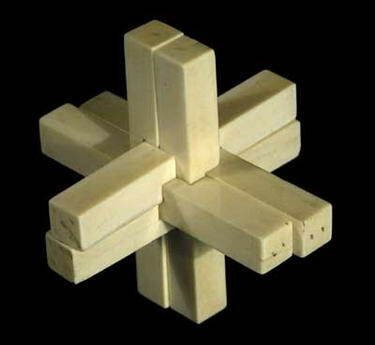 Many people have done work on the puzzle but Bill Cutler and Arthur Cross completed a comprehensive analysis of the solid puzzle in 1975. 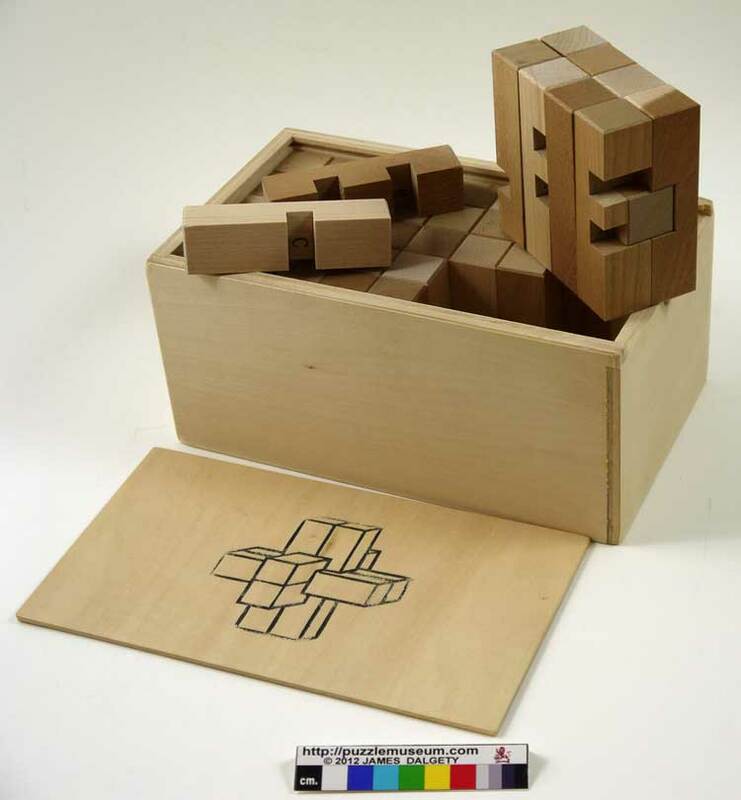 Allowing pieces with "blind corners" (either a chisel must be used, or a unit cube glued into a groove during manufacture), there are 369 different usable pieces that can be made into 119,979 different 6 piece puzzles without internal spaces. Some puzzles have a key piece, some separate into groups of 2 & 4 pieces, and some come apart as two groups of 3 pieces. Some have several solutions and some only one. One puzzle has 6 solutions. If internal spaces are permitted, a more interesting puzzle can be constructed, in which it is necessary to make several moves before the first piece can be removed. These are known as "Holey 6 Piece Burrs". On August the 4th 1990 the last Holey 6 Piece Burr was analyzed by Bill Cutler. Over a two year period various people gave computer time to the project and at one stage a Cray computer was used. It took 62.5 years of computing time running at 8 MHz., which was then the standard speed of a PC, to analyze all 35,657,131,235 puzzles. Solutions were given a "Level" number corresponding to the number of moves required before the first piece can be removed. Of particular interest is the fact that the only Level 12 puzzle was discovered by Bruce Love using his own human brain several years earlier. Akio Kamei made a set in 1987 which looked as if it contained 45 pieces. Actually it was a set of 52 pieces with 7 extra pieces hidden inside. This made it a packing puzzle. See V281 "Ultimate Burr Set"
A beautiful miniature compendium made by Jack Krijnen. This was based on an American Selection of pieces.